With the introduction of the Olympus OM system, a new range of Zuiko lenses was designed by Olympus. The bayonet mount has a very large diameter, and all the lenses are very compact compared to other brands. Compared to many other manufacturers, Olympus took a slightly different approach to lens grading. Where many companies released consumer-class kit lenses made out of inferior products or designs, all Olympus OM lenses were made to the same high standard. The differentiation of the lenses was done simply by their maximum aperture. Referral to the below list of released system lenses will show the 'consumer' model of the OM 50mm for example has a maximum aperture of f/1.8. There was a 'prosumer' model released with a f/1.4 maximum, and even further a professional model with a maximum aperture of f/1.2. Olympus was able to offer this range of very fast, compact lenses due the width of the lens mount. At the height of its success, the OM system had the largest range of f/2 lenses of any camera manufacturer or system ever made before, including f/2 macros and telephoto primes up to 250mm. the autofocus lenses for the OM-707 / OM-77 and OM-101 / OM-88 bodies, those lenses do not have a manual focusing ring and are useless on the other bodies. 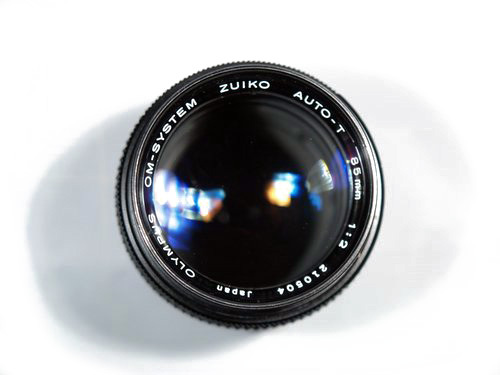 The autofocus lenses were intended for the OM-707 / OM-77 but they can be used on the OM-101 / OM-88 too. The powerfocus lenses are specific to the OM-101 / OM-88. All these lenses lack a manual focusing ring, so cannot be used on manual OM bodies, or 4/3rds cameras (not even with OM adaptors). However, if, when fitting these lenses, they are not twisted all the way on, the front part of the lens can be used as a focusing ring: this still maintains light-tightness. This page was last edited on 20 January 2016, at 06:17.